Google's navigational bar is now available for all international versions of Google, even though the services included in the bar are different from one country to another. There are also changes for the US version of Google (or the global version, if you like). Google removed from the list of services: Blogger, Labs, orkut, Patent Search, but added YouTube, the most popular property after Google Search, and a link to the More Google Products page. Even though this makes Google's interface more consistent, you'll still find services that have an old navigation. Some international Google versions have different services: for example, Google Brazil and Google India include orkut in the main list of links because orkut is very popular there. In many countries, the antiquated Google Directory is still on the homepage. Nice, but what about igoogle? 'antiquated google directory'... What are everybodys thoughts on that? I certainly feel there's a need for directory-like services, especially with regard to localised information. Any idea if there's a plan to integrate the place/business entries on google maps into a directory structure? If i want to see where to eat near me I'd like to be able to check all the options, not just search for 'pub', 'pizza' or 'restaurant'. Yahoo started as a directory, but when the web started to grow in the late 90s, the directory was no longer practical or even relevant. That's why Yahoo acquired some search engines and deemphasized its directory. Now you'll no longer see links to Yahoo Directory from Yahoo's homepage or from any important Yahoo service. Regarding the local directory, Google Maps and other local search engines organize businesses in categories. If you search for [plants, ny], you'll see a list of categories at the top: Florists, Retail Stores - Gift Baskets. This works because Google already gets this information from third-party sources or from the business owners. iGoogle have the original toolbar, but when I click Google Clasic I see the change, with YouTube link. No navigational bar in the Arabic interface either. this makes no sense to me, why does everyone else get an even more button and i don't, ive search endlessly to add one but i cannot find a way to edit the universal search bar. Furthermore, i also do not have youtube in my dropdown menu and I have an integrated google and youtube account..any suggestions or tips? I think Google has started sliding down a slippery slope. I've wasted days trying to get the old nav bar back. This is going to e Goodbye Google for me. I have an intense, passionate hatred of Google for their redesign. There are no words to describe how ugly this is. Their navigational bar NEEDS to be directly above the search bar and beneath the Google logo, where it always has been! I am O.C.D. about how everything is laid out on my computer screen. Google should know that they have ALIENATED O.C.D. people such as myself. I am NO LONGER ABLE to use Google. I used to love using it. But it is so ugly now that I hate it with every beat of my heart!!! 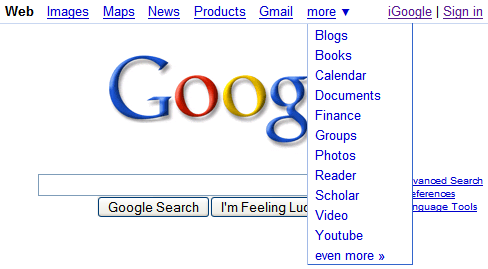 I will never forget logging in to Google one day and seeing the navigational bar at the top of the page. I was so pissed off that I almost broke my keyboard!!! Does anybody know of an add-on for Firefox that will place the navigational bar IN IT'S PROPER PLACE? ?